I’ve been meditating for many, many years. Suffice it to say that I used to double-date with Buddha. In the course of writing reviews, I have tested meditation/mindfulness apps from time to time. Some I have retained for my personal daily use. I find it extremely helpful to take a break and air out my head whether it be for a full session or even a short duration. I think that everyone needs to, yes? There are several variations on how to practice meditation/mindfulness. Some practice with focusing on sounds or repeating mantras. Some with their eyes shut or some with them open. When I came upon this app, it looked very, very familiar. That’s when I had my head slap moment. Introducing Sky Tripping from Uhhhmagine LLC. Sky Tripping brings Earth’s beauty into your living room and into your hands. … Restore your energy as you explore the world from above. Celebrate the majestic coastal views of The Golden State, the vibrant red rock of Devil’s Kitchen Utah, the grand views in Sedona Arizona, and more. When you launch the app, if you have an TV 4th gen or later, it’ll look very familiar to you because it’s the same as the aerials, drone footage of various environments. But extremely aesthetic footage done with a cinematic eye. Since I purchased my TV 4th gen, I find myself watching the aerials instead of the other choices as I find them very relaxing. I particularly enjoy watching them accompanied to music. I find them mesmerizing, hypnotic. After a bit of time, I’m refreshed and ready to pick up where I left off. And as it’s an iOS app, you can grab a moment of relaxation wherever you are. I have been using a popular iOS app that affords you the opportunity to meditate with either your eyes open or closed listening to sounds of nature, sometimes accompanied with ethereal music. It has a host of other relaxation techniques such as bedtime stories read aloud but I’m focusing on the visual aspect here. The only visual options are to watch loops of shots of rain, storms, falling snow, swaying wheat sheaths, and the like. Sky Tripping is an obvious extension of the latter. The difference being were as my other apps shots are locked down loops, these are continuously moving panoramas. Extremely easy to use. On the iPad, first choose the duration of your session. Next pick “today’s meditation scene”: Water, Desert, Forest, or Winter. The app will randomly pick an appropriate scene for you. The one requirement of Sky Tripping is that you can only view the panoramas in landscape mode, which I feel is the best. On an iPad you could probably cheat with portrait mode but on an iPhone it’s a necessity that you can only watch films in landscape mode. This makes for panoramic views that, to me at least, are more immersive. 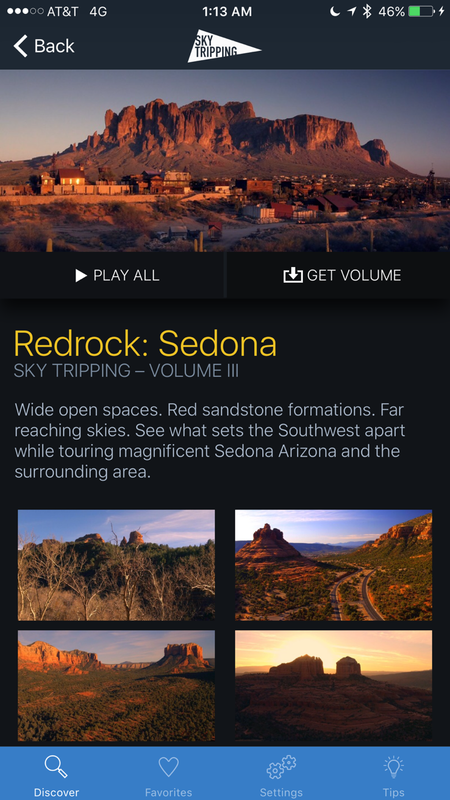 Sky Tripping is available for iOS (requires iOS 10.0 or later) and TV. 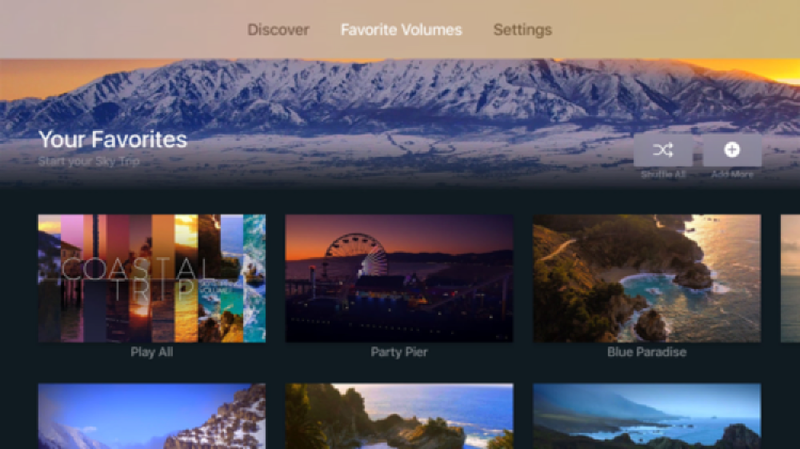 Sky Tripping is free with in-app purchases include all 12 premium films in the Sky Tripping Sampler Pack but can be subscribed to monthly ($5.99/month), on an annual basis ($59.99/year), or a lifetime subscription for the best value. Your purchase includes all 12 films in the Sky Tripping Sampler Pack.